Islamophobia: Fear of Muslims and Islam. On 9/11 of this year a pastor in Gainesville, Florida is calling for all Christians to participate in what he is calling “International Burn a Qur’an Day.” This month Christians gathered outside a mosque in Connecticut to inform worshippers that “Jesus hates Muslims.” The Christian Action Network recently erected a billboard on I-26 near Orangeburg, South Carolina featuring a picture of a fierce Muslim and caption: “Islam Rising, Be Warned.” The Church is becoming obsessed with Islam but often for the wrong reasons. We must not forget what has just happened in Afghanistan, the tragic martyrdom of Christian aid workers, and the price they paid for religious freedom. This ugly incident has a familiar ring to it: “Paul,” a former Muslim who suffered martyrdom, did much to strengthen the fledgling church in Afghanistan. Blinded in infancy when a local doctor prescribed the wrong medicine, he succeeded in memorizing the entire Qur’an (four-fifths the size of the NT) in Arabic (not his mother tongue) by age fourteen and was subsequently invited to an annual, Qur’anic recitation contest in Saudi Arabia, where he won first prize. But since only Saudis had historically achieved such distinction, that year two were awarded first prize: Paul and a Saudi citizen! He was also spiritually nurtured by Pioneer Christian missionary, the late J. Christy Wilson, Jr., pastor of the international church in Kabul before it was bulldozed to the ground in 1973. Despite warnings from various sources that if anyone destroyed the building they would answer to God, Muslims appeared at the gate. Having heard about an “underground church,” but not understanding the English idiom, Afghan police dug down twelve feet to find it. On that day the Government of Muhammad Zahir Shah was overthrown in a coup and intense suffering followed: Kabul was virtually destroyed, millions of refugees fled, a communist government was installed, the Taliban seized power and decades of war have ensued. An Afghan refugee told Wilson: “Ever since our Government destroyed that Christian Church, God has been judging our country.” Yet in the midst of opposition, Paul helped translate the New Testament into Dari (Afghan Persian), his mother tongue. Finally, to avoid persecution he fled to Pakistan in 1985 and had a fruitful ministry among Afghan believing refugees. While he was in exile I invited him to my city (DGK) of service in SW Pakistan where he spoke boldly and brilliantly to Muslims about Jesus. On March 23, 1988 he was “tricked” (God makes no mistakes!) into returning to Afghanistan, kidnapped, tortured and killed by Gulbuddin Hekmatyar. Reportedly, his tongue was cut out before being shot because he refused to stop speaking for his Lord. God’s work in Afghanistan today of drawing people to himself has come because believers have been willing to die for Christ. In fact, Christians in Islamic contexts are often persecuted, and may even be martyred. Throughout history suffering has been part of Christian witness and vital for the growth of the church. A recent NY Times article, “In Pakistan, Taliban Hint at Attack on Relief Workers” may be an omen of things to come, and proves how much Muslims need the Gospel. We ask why God allowed such a tragedy but biblically we shouldn’t be surprised. “A time is coming when anyone who kills you will think he is offering a service to God” (Jn. 16:2). Suffering is to be expected so let’s pray God will use it for His glory. With great sadness I want to let you know that one of 10 Christian workers who were killed in Afghanistan on August 5th (Yahoo News) was my friend and former flat mate Daniela Beyer. Daniela was a linguist and translator. From July 20th to August 4th she traveled with a mobile eye clinic team through the remote north of Afghanistan, assisting with her knowledge of the local languages as well as her tracking experience from previous language survey trips in the area. She was working with a very experienced organization and team and the trip to the north happened at the invitation of the local community. The team had finished their medical work and was on their way back to Kabul when they were attacked and killed. The Taliban have claimed responsibility for their death. I met Daniela during my first semester at the University of Leipzig. From the very beginning we found that we had many things in common. We both studied language-related subjects and had many of the same interests and passions. She graduated with a degree in Russian and English and went on to study Teaching German as a Foreign Language as well as theology. I graduated with a degree in linguistics and went on to study Russian. She was one of the few people in my life with whom I could have professional discussions, and we often helped each other out with advice and material, proof-reading each other’s papers and theses. When I moved within Leipzig, she took over my old apartment, only to join me later in the new one. Our flat-sharing community involved between 3 and 5 people and lasted about 3 years. We formed strong bonds throughout those student days, sharing life with its pains and joys and walking together as Christians. Both Daniela and I had plans to serve as Christians overseas and we wondered if we might end up in the same project, given our very similar gifts. Although that never happened, I had the privilege of sharing some of her journey of figuring out her place and calling. Together we attended an information week-end on Central Asia which gave us the first in-depth exposure to the region and planted a love for it in our hearts. We separately went on look-and-see trips to Central Asia, visiting some of the same projects and people. Whereas I had a clear vision of what I wanted to do and pretty quickly joined a translation project in Kazakhstan, Daniela had it much harder in deciding about her future. She was a helper at heart, neither particularly courageous nor adventurous. Her only plan in life was to serve God and do His will, and she went through great struggles in discerning it. Our last meeting took place in 2007: She was preparing to start her work in Afghanistan, just as I was finishing up in Kazakhstan and preparing to get married. Some of my favorite memories include visiting Daniela during her studies in Gießen. I still wear the wrist-watch which we chose together, and I remember her kind care when I crashed in her apartment with dehydration and acute hearing loss on a hot, stressful summer day. Daniela was very close to her family – her parents, two sisters and a brother, some of whom I had the privilege of knowing personally. My thoughts go out to them and I deeply grieve with them over the loss of such a fine daughter and sister. Daniela constantly put other people first and was always ready to help out. With the years she seemed to become increasingly aware of her own weakness, and yet in the midst of it she grew stronger and knew God more deeply. She was the only one of us who never got married, and she used her singleness to go to places where few of us marrieds can go. Her life was a life lived self-sacrificially; a life lived to the full and well spent. Although we have a hard time accepting it, God decided that her work was done and took her home to things much better than she ever could have had here on earth. I am proud to have known Daniela. While I lost one of the closest companions in my life, I pray that through her death there would be much greater gain to God’s kingdom. The UN estimates that the humanitarian crisis in Pakistan is now larger than the combined effects of the three worst natural disasters to strike in the past decade, including the Tsunami and major earthquakes that devastated Kashmir and Haiti. 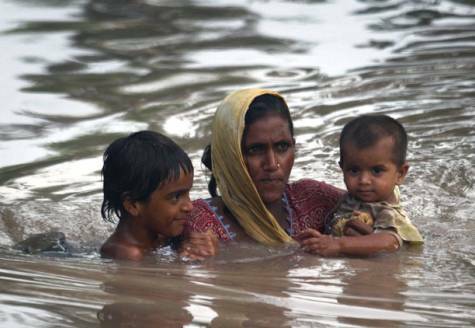 Typically, rain in Pakistan is spread over three months, but this year it fell in one week. “Rivers just can’t cope with all that water in such a short time. It was five times, maybe ten times more than normal,” says Rajiv Sinha of the Indian Institute of Technology. Folks we lived and worked with in Pakistan are in dire straits. Muslims, and former Muslims, including a pastor friend escaped, but with nothing except the clothes on their backs. DGK, where we worked for 23 years has become an island, surrounded by water and all roads leading into it are closed. The Good News Center we started now shelters 6-7 extended families. Money can be mailed to Christar: PO Box 850357, Richardson, TX 75085 the organization we served with or you can give online (project acct # 3027). Please take a few minutes to view a shocking video that could have serious repercussions all over the world. Pastor Terry Jones of the Dove World Outreach Center in Gainesville, FL is asking Americans to burn the Qur’an on 9/11. He attacks Islam verbally and then on video tells Christians to band together and burn the Muslim holy book. Concerned Christians are speaking out against this, for example, Christianity Today, “Evangelical Leaders Pan Qur’an Burn Plan.” The NAE (National Association of Evangelicals) quoted Richard Land of the Southern Baptist calling it “appalling, disgusting, and brainless,” but one wonders if the pastor is getting the message. My first action was to phone the Dove World Outreach Center a secretary said the pastor probably wouldn’t have time to talk to me. I wanted to tell Dr. Jones that in Pakistan, where my wife and I spent twenty-three years, national Christians worry that statements made by American evangelicals against Islam, or the prophet of Islam, makes it much harder for them. This is true of all national believers and Christian aid workers throughout the Middle East. The lawyer is right that nothing can be done legally to prevent the Qur’an burning on September 11, but does he realize how much trouble a misguided pastor can cause? He went on to defend the pastor’s right with these words: “You can’t prevent something that is a mixture of religion and speech. If precedents are established that religious beliefs can constitute hate speech, the danger is that pastors will be limited in what they can say. As far-fetched as it seems, it’s already happening in some countries like Canada and I think England.” Can we learn something from the countries mentioned by the attorney? I am an American citizen, but hold dual citizenship because I was born in Canada. A little control over what a pastor can and cannot say might be a good thing. If the only recourse left is to initiate a petition against it would you sign it? Danger at the Arab Festival in Dearborn? I did not attend the Annual Arab Festival in Dearborn, but have watched YouTube videos, read eye-witness accounts, and talked to several people who were there. The trouble evidently began last year when one particular group attended the festival, made a video, and then posted it on YouTube. In the video the astonishing claim was made that Shariah Law had been established in Dearborn. (This was despite the fact that Christian organizations have been distributing literature at the festival for the last fourteen years.) Due to the video’s inflammatory title and content there were about two million hits, and the City of Dearborn was inundated with mail, much of it hateful. This year the same organization returned, set up video cameras, and four of their members were promptly arrested. The police were doing their duty, but ironically that action provided necessary “proof” the group needed to substantiate sensational claims. Additional videos have since been posted by others and the controversy is growing. Opportunities for Christian witness among Muslims in Dearborn remind me of missionary work in South Asia where I spent twenty-three years. My colleagues and I often distributed literature at religious and secular fairs but the approach was usually to check with authorities and rent a booth. Sometimes we got into spirited discussions on theological issues, such as how Jesus could be the Son of God, but we did not think we had to be aggressive and confrontational to win a hearing. Neither did we set up video cameras to attract attention. We tried to be winsome, while not sidestepping controversial issues and what we invariably found was that some had never heard of Jesus. Few understood the Gospel. This is also true to a certain extent of many Muslims who attend the Arab Festival in Dearborn and the danger is that the credibility of our witness is being undermined by in-fighting. Our purpose is not to beat up on Islam or pick a fight with Muslims but to help them understand the Good News. Evangelism may involve public preaching, and even occasional debating, but more often it will be on an individual basis. Whatever the method we must speak the “truth in love” (Ephesians 4:15) but what has taken place in Dearborn is a bad testimony: to the police, to Arabs in the area (most of them are Christian), but worst of all to Muslims who are watching these videos all over the world. The only one to gain from such controversy is Satan. We need to pray for reconciliation so that Muslims will be attracted to Jesus.